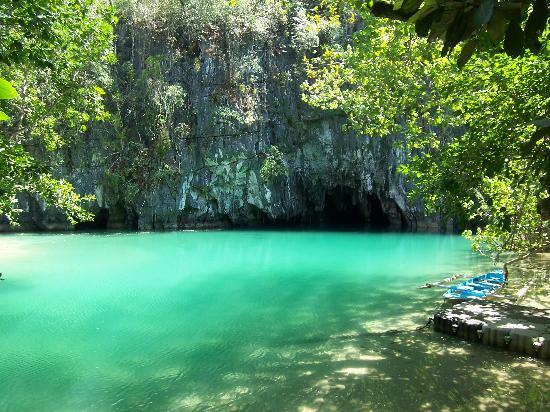 On 23 February 2010, the Official New7Wonders of Nature Philippines Finalist welcomed its President, Gloria Macapagal-Arroyo, for a boat tour of the 8-km-long Puerto Princesa Underground River. She called for Filipinos around the world to join with people everywhere in voting for the subterranean waterway, which runs through a deep cavern full of extraordinary rock formations, below rugged limestone and marble cliffs, before emptying into an underground lagoon with crystalline waters. President Macapagal-Arroyo was joined during her almost one-hour boat tour of the Underground River by national, regional and local figures, notably lead New7Wonders campaigner Puerto Princesa Mayor Edward S. Hagedorn. The visit was part of a trip emphasizing sustainable tourism growth across the Philippines. Data shows the Puerto Princesa region posting record growths in tourism, even as in 2009 tourist arrivals declined by 8.5 percent worldwide and 6.7 percent in the Asia Pacific region.